Dr. Husayn Shahrur, Managing Director of the MENA Asset Management Department at NBK Capital attended the First “Teaching and Learning Excellence Forum” Panel Discussion at the Australian College of Kuwait as part of the panel discussion on industry requirements from educational institutes, challenges of the job market, and what is required from educators to equip graduates with employable skills. The Australian College of Kuwait held its first “Teaching and Learning Excellence Forum” with the objective of establishing a platform for educators in Kuwait to shed light on the challenges at the job market, to share best practices and develop recommendations to enhance the education sector in order to graduate skillful human capital. The forum hosted an esteemed panel of educators, education officials and industry representatives from PUC, World Bank, Kuwait Banking Association, petroleum companies, banks and investment companies. Dr. Husayn highlighted the main challenges facing the industry employers when receiving the educational institutes’ graduates, recommending youth should be equipped with practical knowledge such as critical thinking, problem solving and innovative skills to be better prepared to march into the job market. These tools coupled with personal traits such as intuition, work ethics, integrity and genuine passion make for an ideal candidate. 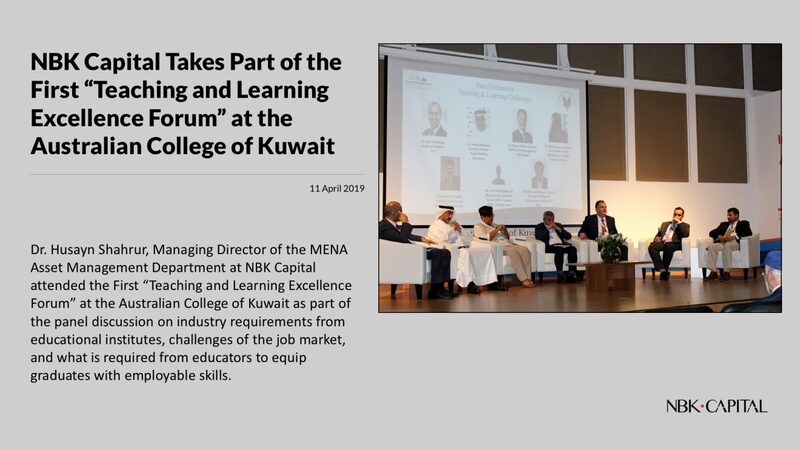 By participating in this forum, NBK Capital continues to set an example for the industry to fill the gap between education institutes and industry professionals to empower the nation’s youth through practical recommendations.